After more than three years of Navy and Marine aircraft striking ISIS from the sea, there are fewer targets in Iraq and Syria to go after. Now carrier-based pilots of the Theodore Roosevelt Carrier Strike Group/CSG-9 have more time to support U.S. and partner troops on the ground, as well as take on strike missions in Afghanistan to keep pressure on Taliban targets. 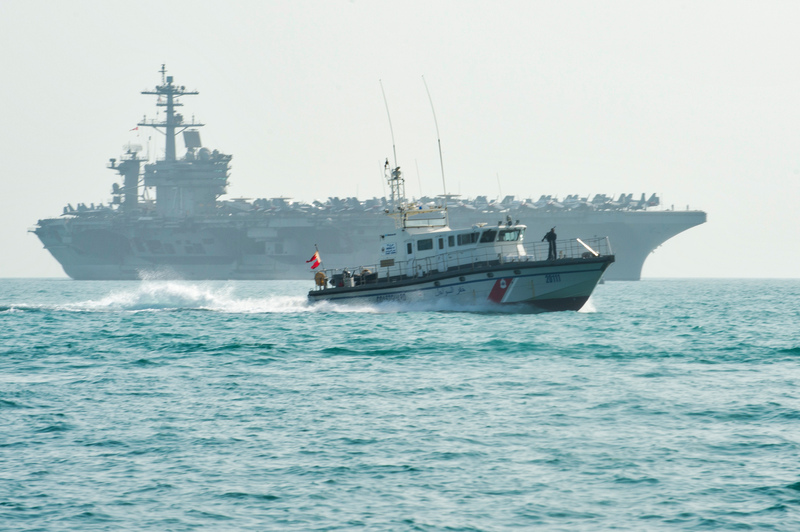 In the Gulf, the ships and aircraft that operate close to “The Big Stick” have seen harassment from Iranian fast attack craft cease but the threat from Iranian unmanned aerial vehicles grow to a daily concern. Carrier Air Wing (CVW) 17 commander Capt. 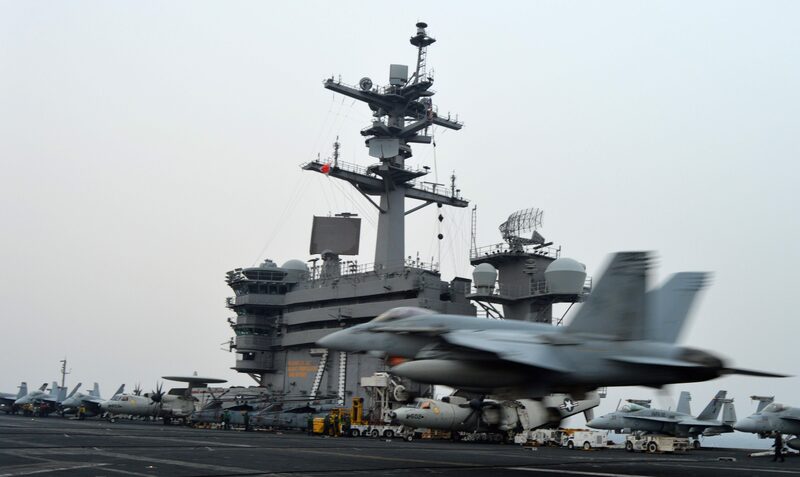 Chris Ford told USNI News during a three-day visit to USS Theodore Roosevelt (CVN-71) and cruiser USS Bunker Hill (CG-52) that the air wing has been flying about 15 to 20 sorties a day, mostly to support the anti-ISIS Operation Inherent Resolve. 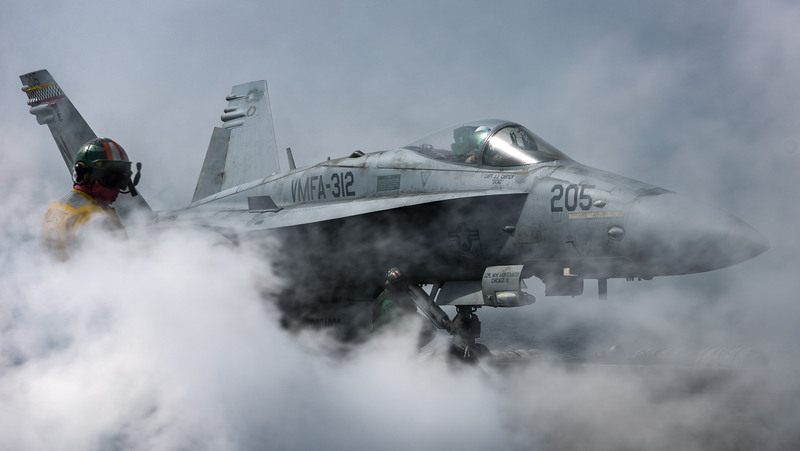 Though the operation has been supported by a string of carrier strike groups in recent years, one pilot told USNI News that the air operation is night-and-day different than CVW-17’s last deployment to the region three years ago. 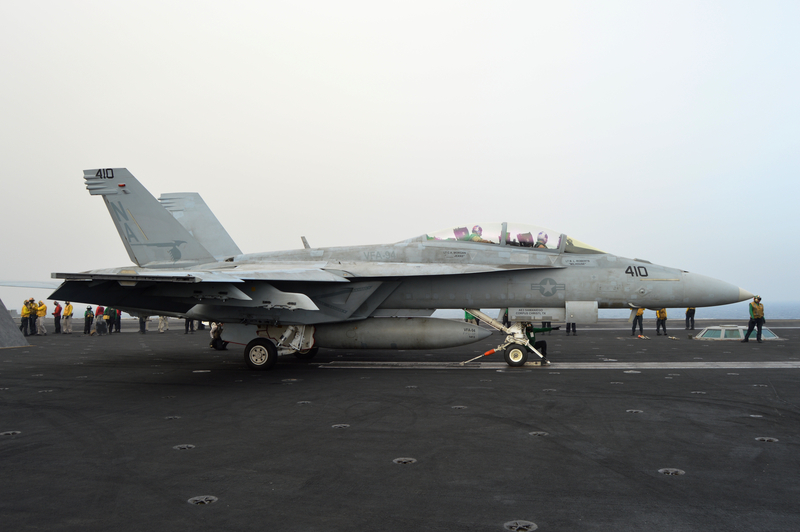 Lt. Joe Anderson, an F/A-18F pilot with the “Mighty Shrikes” of Strike Fighter Squadron (VFA) 94, said three years ago CVW-17 – then deployed on carrier USS Carl Vinson (CVN-70) – was the second air wing to show up to the anti-ISIS fight. “This is when it first started, ISIS was just steamrolling across Iraq and Syria and there wasn’t really much resistance going on. There was a lot of activity, so most of the time I think [air crew] would drop their bombs – but not because there was any less restrictive rules of engagement or we were just targeting things willy-nilly; it was more so just that there were that many ISIS fighters out there. … There weren’t a whole lot of places you could go where there was no ISIS presence about three years ago,” he said. An F/A-18F with the “Mighty Shrikes” of Strike Fighter Squadron (VFA) 94 prepares to launch from USS Theodore Roosevelt CVN-71) on March 10, 2018. USNI News photo. The Afghanistan mission is new for the TR CSG compared to recent carrier strike group deployments to the Persian Gulf. In December the air wing was tasked with providing air strikes for the Operation Freedom’s Sentinel campaign “focused on Helmand province and has specifically identified targets that aim to disrupt Taliban revenue generation at opium-processing facilities, as well as training camps and command and control (C2) nodes,” according to a Navy news release. “The missions to Afghanistan are sort of right at the limits of what we want our aircrew flying at from a fatigue standpoint, but it’s still within reach, and with the Air Force tanking support that gets us there it’s totally possible,” Deputy Air Wing Commander Capt. Robert Loughran told USNI News. “Typically, it’s about another hour on each end – when we fly those missions from where we’re at right now, it’s about 1,300 miles just one way,” Ford added. As of the USNI News embark, the strike group had flown 1,027 sorties in support of Operation Inherent Resolve in Iraq and Syria and 12 sorties in support of Operation Freedom’s Sentinel in Afghanistan. Though USNI News did not get a final tally of bombs dropped, the Afghanistan missions have been more focused on dropping munitions compared to the CAS-driven OIR missions. In one case involving VFA-94, which Anderson did not participate in, the squadron sent three planes and dropped 28 bombs on Taliban targets. During the air wing’s time in 5th Fleet specifically, CVW-17 aircrews flew 17,561 flight hours – about 7,200 of which were in support of OIR, the rest of which were defense of the carrier, training, tanking and other missions. Aside from the evolving offensive nature of the mission, the defensive side has changed too. 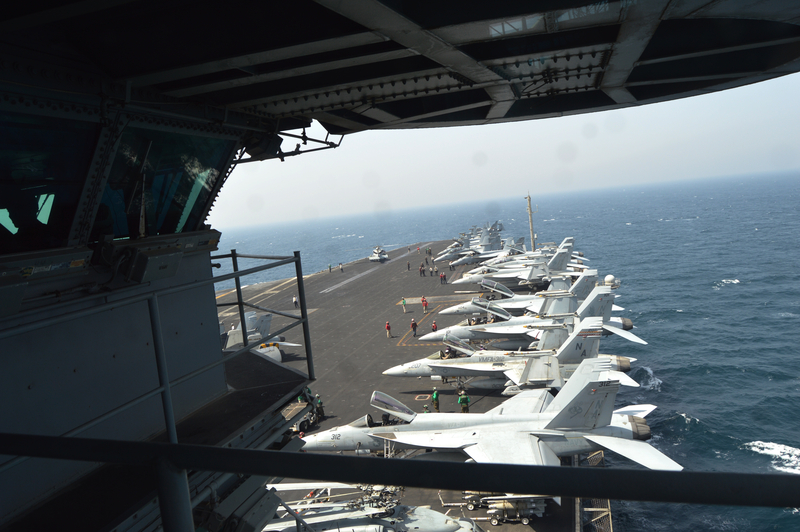 Koehler said the carrier strike group encounters large Iranian drones nearly every day. While there is nothing the Navy can do about the presence of these drones – while operating in the maritime common, anyone is free to be there – the current discussion is how much effort to expend on monitoring the activities and location of these drones, and how the Navy might respond if Iran were to begin arming them. “Even if they’re unarmed, it’s a safety of flight problem. So no matter what altitude they’re at, we have airplanes operating too. So can we communicate with them in the ground station and will they respond? And we see that they do sometimes and they don’t sometimes,” Koehler said in a sit-down interview in his cabin. But Iran arming them would be a “whole new game,” the admiral said. USS Theodore Roosevelt CVN-71) operates in the Persian Gulf on March 10, 2018. USNI News photo. In addition to the Iranian drone threat, the TR CSG has also been challenged by ongoing anti-ship missile and potential mine threats off the coast of Yemen, forcing a destroyer to split off from the strike group and work to ensure continued freedom of navigation in the Bab-el-Mandeb Strait. Due to operational needs throughout the 5th Fleet area of operations, Koehler has only had two of his four surface combatants – one cruiser and one destroyer – with the carrier during operations. Those combatants sometimes have to depart for maintenance, port calls or other engagements, though, so the strike group has developed a close partnership with the French and Australian navies operating in the area. 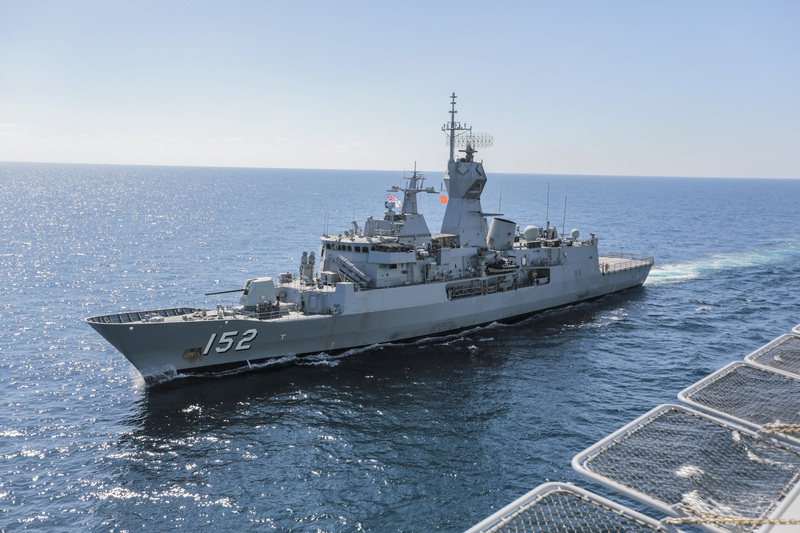 A Royal Australian Navy frigate, HMAS Warramunga (FFH 152), was assigned to the strike group for a couple weeks. After some cross-deck work and training, Koehler said he was able to use that ship for defense in depth, which allowed his destroyer to head into port. “The French ship (destroyer Jean De Vienne (D 643)) was a next step up. It ultimately was with us for about a month. What we trained together to have her ultimately do was take over the air defense-specific responsibility for the strike group, which she did. And to the point of, the cruiser … went into port. And she then, as a coalition French partner, was responsible to me for our air defense,” Koehler said. Ultimately, Bunker Hill was away from the carrier for a full week before resuming its role as the air warfare commander.